LG plans to release a new product line in early 2012. Begins with Optimus L3, simple and powerful Android phone. LG Optimus L3 try to offer the experience of an advanced smartphone in a tiny body, and therefore attractive design phone is equipped with reliable technology. 3.2 inch screen that carried the phone is claimed is ideal for 'trip' to social networking, surfing the internet or reading email. And with a capacity of 1500 mAh battery, Optimus promised L3 able to live longer than mobile phones in its class. "We try to alw`ys give you different options to many smartphone users, and we think L3 Optimus offers all the basic benefits of a smartphone in a more premium packages in this category," Jong-seok Park, President and CEO of LG Mobile Communications. 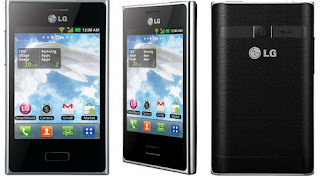 Quoted from androidcentral, Monday (05/03/2012), LG Optimus L3 will be launched at March 2012 in Europe. Then proceed to some other regions including Asia. Luxury car maker Mercedes Benz made ​​transparent car. Using a kind of camouflage technology, Mercedes Benz car is almost completely invisible except look at the wheels. What is the secret of this technology? Mercedes engineers covering one part of the car with LED display. Then on the opposite side of the Canon 5D Mark mounted camera for video recording. Well, the camera is recording in real time situation on one side. Then the results are displayed on the other side of the car. Be the car look translucent. Invisibility technology was initiated by scientists at the University of Tokyo, Japan. Mercedes designed the car to display in the transparent video ad about hydrogen powered cars. There is no information whether these unique cars will be mass produced. Silahkan diutak atik sendiri dan lihat perubahan di mode Expand biar lebih jelas. Selamat mencoba dengan kreasi yang lebih atraktif. Android.Counterclank considered as the advertiser who has invaded the privacy of the users of Android phones. A number of data was uploaded without the owner's knowledge, what are they? Although not categorized as malware, but the presence of a slip Android.Counterclank 13 Android applications should be wary. Therefore, this application can move without permission of the owner of the phone. As reported by Symantec, Saturday (04/02/2012), embedded applications Android.Counterclank will automatically transmit user data, such as IMEI number, brand, screen size mobile phone, and your operating system to a server that has been determined that apperhand.com . In addition Android.Counterclank will make some changes to the phones, such as changing the home page on the browser, adding bookmarks that ultimately refer to the site searchwebmobile.com. For information, searchwebmobile.com a third party site that will provide compensation dollars for applications that drive the search through their website. Until now, applications that contain Android.Counterclank still circulating freely in the Android Market. According to Symantec, Google refused to remove this application because they do not violate their rules.